It's said that you dress according to your mood. But why not the other way around? With Pebeo Setacolor fabric paints, you can not only give clothes a new life, but also cushions, lampshades, table linens and much more! All it takes is a pen or a brush and a few Pebeo fabric colors. Transform your fabrics with your own touch of magic! The Setacolor Light Fabrics Glitter range includes a palette of 9 colors with a perfectly matching same color base giving a sophisticated and effervescent range dedicated to the decoration of light colored fabrics . Ready to use, sparkling and intense, it is recommended to use them pure to avoid the homogeneity of the effect from altering. 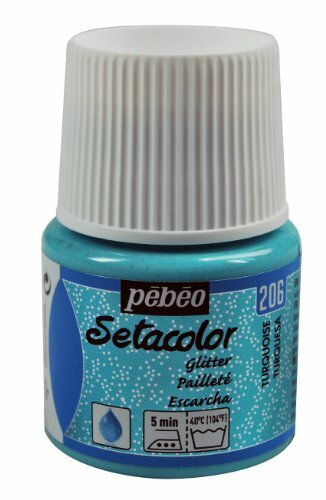 Setacolor light fabrics Glitter is suitable for various textile decorating techniques: brush work, dropper, acetate, plastic bubbles, stamp. Setacolor colors are fixed by ironing on the reverse side of the decorated fabric for 5 minutes on cotton position with no steam. It is also possible to put the fabric in a kitchen oven: After 5 minutes at 150 Degree C (300 Degree F) the colors are fixed. Once fixed, the colors are lightfast and resist machine washing at 40 Degree C (100 Degree F).